French rabbi; born at Metz Dec. 28, 1822; died at Paris in 1890. He studied at Marmoutier under his uncle Jacob Haguenauer, a famous Talmudist, and later at Merzig, Prussia, under the Talmudist Moïse Lévy, known also as R. Mochè Merzig. After completing his studies at the rabbinical school of Metz, Trénel was appointed rabbi at Besançon; he resigned that office soon after, however, and went to Paris, where he was for a time secretary of the Comité de Bienfaisance Israélite. After some years he was appointed assistant to the chief rabbi of Paris, and in 1856 director of the Ecole Centrale Rabbinique, which was transferred to Paris in 1859; he retained the latter office until his death. 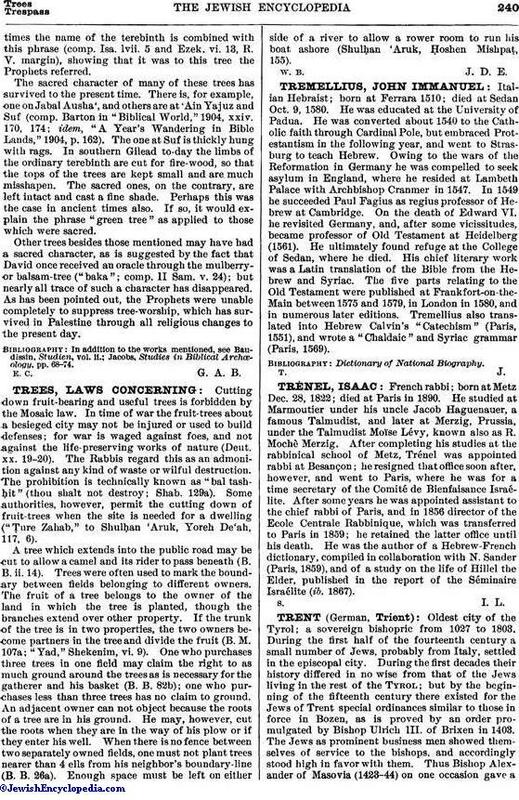 He was the author of a Hebrew-French dictionary, compiled in collaboration with N. Sander (Paris, 1859), and of a study on the life of Hillel the Elder, published in the report of the Séminaire Israélite (ib. 1867).